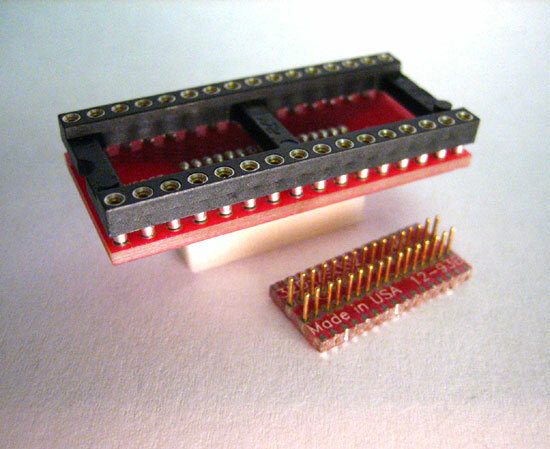 This is a two part adapter kit providing a way to temporarily connect a DIP component socket to PCB surface mount pads on a circuit card under test. The bottom part, (SMT base), is surface mounted to the PCB and replaces the component normally soldered to the card solder pads. The top part plugs on to the SMT base and has a DIP socket on top. Adapters are listed in ascending adapter top DIP pin receptacle count order. 8D6-SO30-SD 8 DIP socket to surface mount circuit board pads. 32D6-SO30-SD From a 32 DIP socket to surface mount circuit board pads..
32D6-SO42-SD From a 32 DIP socket to surface mount circuit board pads. 48D6-48TSO8-SD DIP pin socket to surface mount circuit board pads. 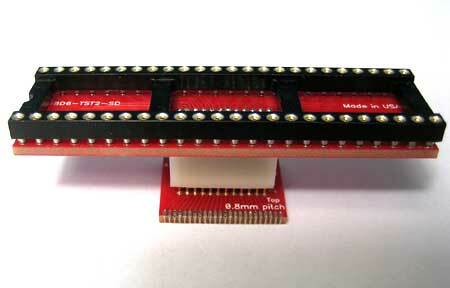 48D6-TST20-SD DIP pin socket to surface mount circuit board pads. 48D6-TST2-50-SD DIP pin socket to surface mount circuit board pads. Aprilog.com is a Division of Enable Engineering Co., Inc.